After having watched Seb, I have a much better understanding of best practices and possibilities that the canvas brings. Seb teaches courses and hosts the creative coder podcast — he is both highly informative and hilariously entertaining, definitely check his stuff out. A few months ago, a Quora thread popped up that asked how to programmatically parse a sentence, and determine whether a “that’s what she said” is appropriate. Well, James Socol built Scottbot (for Micheal Scott, of course), an IRC bot that tries to do just that. It still has a ways to go, but the project is open source and looking for contributors. Rob Spectre is not a Yankees fan. In fact, he hates the Yankees. Rob knew Derek Jeter’s 3000th hit was approaching, and he wanted no part of this news to pollute his internets. So he made Jeter Filter to remove all traces of Derek Jeter from the internet. 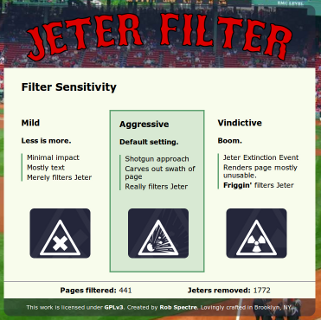 Jeter Filter is a chrome plugin and has three different settings (mild, aggressive, and vindictive) you can choose from depending on how much you hate Derek jeter. Unfortunately, Rob will unlikely be able to read this post as I am sure he is currently browsing on vindictive. I’m not sure why it took me so long to find out about Loosecubes, but it is awesome. In one sentence, it is the AirBnb of co-working spaces. I used it while I was in NYC to find a space to work at, which coincidentally was the Loosecubes office. They treated me to a desk, monitor, and tea all in a beautiful Brooklyn office, for free. Loosecubes is perfect for those who travel a lot and need a space to work during the day. It’s also great for people that have extra space to get some use out of it and to meet new people in the area. Those are my favorite things. Tomorrow I will be at the International Startup Festival in Montreal. Say hello to me if you’re there (I’ll be the guy with black hair wearing bluejeans and a t-shirt). You can, if you would like, follow me on twitter here.